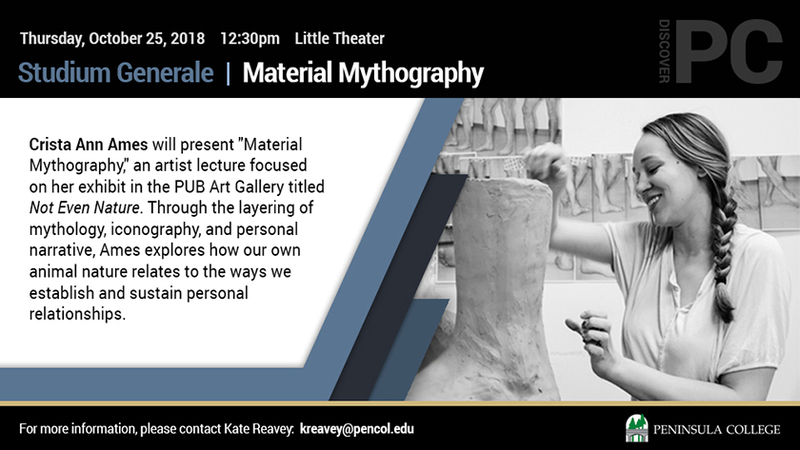 Sculptor Crista Ann Ames will offer an artist lecture titled "Material Mythography" on Thursday, October 25, at 12:30pm in The Little Theater on the main campus of Peninsula College. A reception will follow at 1:30 pm in the Gallery where her solo exhibition "Not Even Nature" is on display. Through the layering of mythology, iconography and personal narrative, Ames explores how our own animal nature relates to the ways we establish and sustain personal relationships. The show, which runs through October 25, features work in ceramics, wood, and textiles. Raised on a small hobby farm in Washington State, Ames often draws on her own experiences to explore pastoral life, animal husbandry, women’s craft and fertility. Ames attended Washington State University where she obtained her Bachelors of Fine Arts in Ceramics with a minor in Art History and Disability Studies. After receiving her BFA, she attended Utah State University for Post Baccalaureate studies in Ceramics. While receiving her Master of Fine Arts degree from the University of Montana she began studio dance and movement to help inform the way she sculpts the figure. She has been an artist in residence at A.I.R. Valluaris in France, Guldagergaard International Ceramics Research Center in Denmark, the Archie Bray Foundation in Helena, MT, and The Clay Studio of Missoula. Crista is currently a long term resident at Red Lodge Clay Center. “In bridging the gap between myth and experience, I utilize my artistic practice to create altogether new stories that tell contemporary tales of trauma, joy and womanhood,” Ames said. Both the solo exhibition and the Studium presentation are free and open to the public. For more information contact Dr. Kate Reavey at kreavey@pencol.edu or Michael Paul Miller at mpmiller@pencol.edu.